South Mountain Park is one of the largest city parks in the world. At nearly 17,000 acres it certainly covers a lot of ground, although it isn't a park in the sense of grass, and playgrounds, and lakes, and ducks, as one might think. South Mountain Park is a desert mountain preserve. There are more than 50 miles of trails at this park. South Mountain Park is located at 10919 S. Central Avenue. It is part of the Phoenix Mountains Preserve system. There is no entry fee. There are four basic activities that you can enjoy at South Mountain Park. You can bring your family or a group of 5,000 people to various meeting areas and ramadas at South Mountain Park. The Piedra Grandes Ramadas are available only on a first-come, first-served basis. The ramadas accommodate very small groups, and groups up to 50 people. Alcohol permits are required. No amplified or live music is allowed. There are restrooms nearby. Larger ramadas for groups larger than 50 people are available with reservations only, which must be made in advance by calling (602) 495-0222. There are about 58 miles of trails at your disposal. The more than 10 different trails in South Mountain Park range from 1 mile in length to 14 miles. They are rated in difficulty from moderate to very difficult. The easiest of the trails is the Javelina Canyon Trail which starts at the Beverly Canyon parking lot at 46th Street, south of Baseline Road. South Mountain Park has very rugged, desert terrain. All the trails are rocky and steep. You might encounter desert critters, including rattlesnakes. Just give them plenty of room and keep going. Always carry plenty of water with you, wear sturdy shoes, a hat and sunscreen. Dobbins Lookout, at 2,330 feet, is the highest point in the park accessible by trail. For more information about mountain biking at South Mountain Park, check MountainBikeAZ.com. South Mountain Park is a beautiful place to get on a horse and wander around. Guided trail rides are available to riders of all levels of experience. Keep in mind that riding is limited during the summer months. For information about trail rides, breakfast rides and cookout rides, contact Ponderosa Stables and South Mountain Stables. More people probably visit South Mountain Park for the scenic drive and views than for anything else. If you are a nervous driver or a nervous passenger, be aware that this drive is on a winding mountain road that isn't too wide. You are also sharing that road with bikers and tourists and vehicles stopped at the side of the road where there may not be much room for parking. Take it slow. On a clear day, the view from Dobbins Point, is just gorgeous. Stop at the main gate on your way into the park and pick up a map, then keep driving up to Dobbins Point. For a southern view, drive up toward the towers. The signage on the roads is clear. The South Mountain Park Environmental Education Center is open Wednesday through Sunday, 8 a.m. to 2 p.m. There you can learn more about the plants, animals, and history of South Mountain. All dates, times and offerings are subject to change without notice. South Mountain Park is the largest municipal park in the country, covering about 16,000 acres and including more than 51 miles of trails. Dobbins Peak, the highest point accessible to visitors (and you can get drive there if hiking isn't in your plan) is 2,330 feet in elevation. Not too high for the hiker or bicyclist who isn't ready for steep trails, but high enough to offer great views of the city. Here are pictures of a scenic drive through South Mountain Park. This map of South Mountain Park/Preserve is intended to assist you in finding the parking areas and trailheads. Hiking trail markings are general and are not intended to actually measure distances. The gated roadways, trailhead parking areas, restrooms, and ramadas are open from 5 a.m. to 7 p.m. at which time the gates to the park close. Trails are open until 11 p.m. On one Sunday of each month South Mountain park is closed to all vehicular traffic.It is called Silent Sunday. Check the South Mountain website for any scheduled closings and for Sundays when cars/trucks are not permitted in the park. South Mountain Park is located in South Phoenix. From Baseline Road and Central Avenue, head south on Central until you come to the park entrance. From I-17 going south, exit 7th Ave./Central Ave. Stay on Frontage Road to Central, turn right to go south. From I-10 going east, exit 7th Ave. Go south to Baseline Road, east on Baseline to Central Ave., turn right to go south on Central Ave.
From I-10 going west, exit Baseline Road, turn left, go to Central Ave. and turn left (south). The winding road to Dobbins Point in South Mountain Park. The park is located in the southern part of Phoenix, AZ. Driving at South Mountain Park isn't for the nervous driver or passenger. This sign in South Mountain Park on the way up to Dobbins Point says, "Winding Park Roads 15 MPH on Curves." Good advice. It doesn't take long on your way to the top of South Mountain to see a spectacular view of downtown Phoenix to the north and Camelback Mountain to the east of downtown. If you keep going up past Dobbins Point, you can get up close and personal with the South Mountain towers. 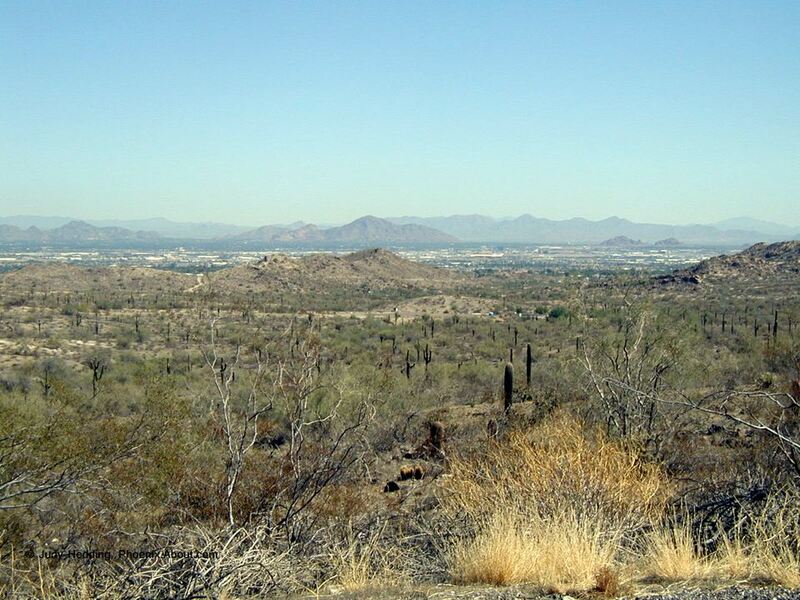 From the Gila Valley Lookout you can see wonderful views of Tempe, Chandler, and the south side of South Mountain, including Ahwatukee Foothills and Mountain Park Ranch. At South Mountain Park there are several ramadas available for barbecuing and picnicking. In this picture, you can see the towers at the top of South Mountain. Hikers and picnickers share South Mountain Park with horses and their riders. Several stables offer rides in South Mountain Park. South Mountain Park has more than 50 miles of trails for hiking, biking, and riding horses.